Today I am going to read the first book I completed in our 2015 Book Challenge. Yeah - after I just told you I was stick in a Dystopian Future rut. I read a Dystopian Future book. Stick with me here. 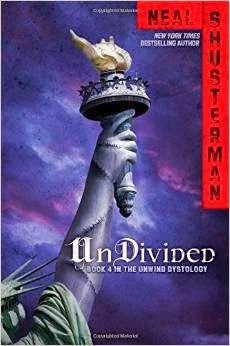 Undivided is the 4th book in a Dystopian Future series called "Unwind". I love, love, love Dystopian Future books and have read series after series this past year. This one was pretty good. In this book - the Pro-Life and Pro-Choice armies have come to an agreement. Every kid under the age of 18, but over the age of 13, can be unwound by their parents if their parents choose to. According to the folks who made up the rules of unwinding, the child's life doesn't really end because every part of the child is transplanted into various recipients. Crazy, right? So basically, your kid gets on your nerves, you sign an order and they are taken away and unwound to people who need organs. The books were easy reads. The hero of the books is a kid named Connor who escapes his unwinding. It follows his journey - and all the people he meets along the way - and.....well - I don't want to give it away, now do I? If you like Dystopian Future, this would be a good choice. It got a 4 1/2 star rating on Amazon. I would probably give it a 3 1/2 or 4.